There are many straight handrails and guardrails offered by numerous companies but what if your home has a curved deck or curved balcony? Well, we have a solution to this problem: beautifully designed curved handrails. When building a curved deck or a curved balcony following any kind of arc, the difficulty of the construction is increased dramatically. 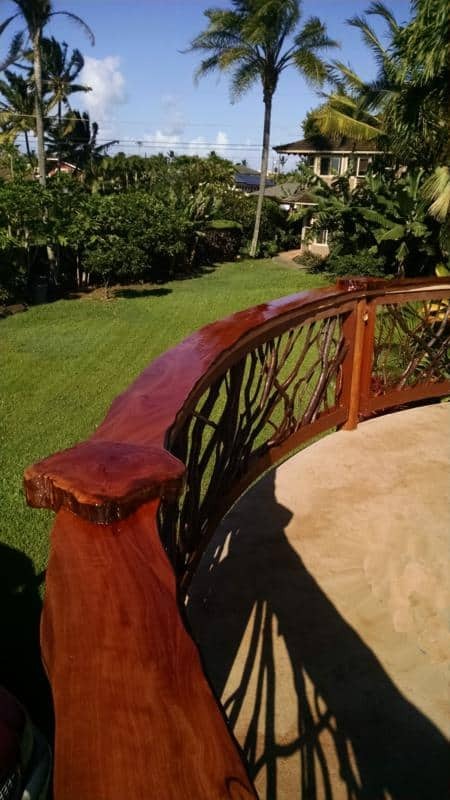 Curved handrails can be equally challenging to build, and there is no better masterwork than a curved deck railing from Mountain Laurel Handrails. This particular deck has two different curves which were faithfully replicated in our workshop. 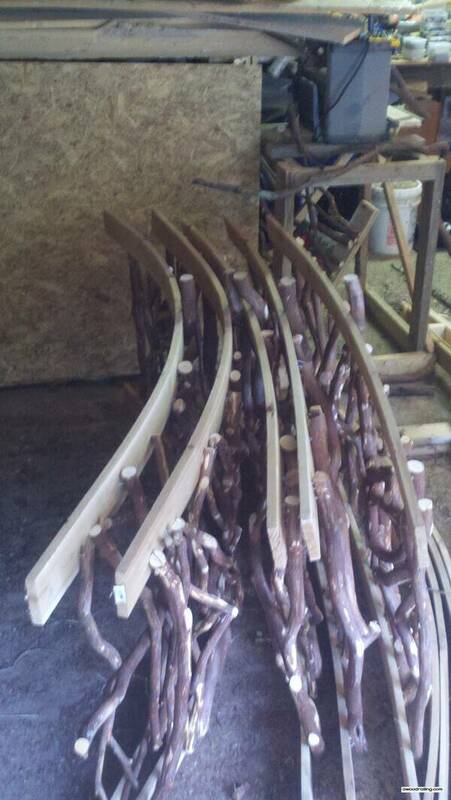 And on this page, you’re going to get a peek at how we create a curved railing system that is shipped ready to install! Curved handrails don’t only have a place outside on your deck or balcony. 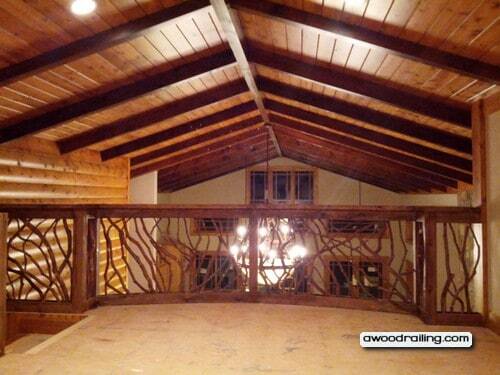 For the interior of the home, a curved balcony railing makes a strong visual statement. It’s unique and not often seen in homes these days. 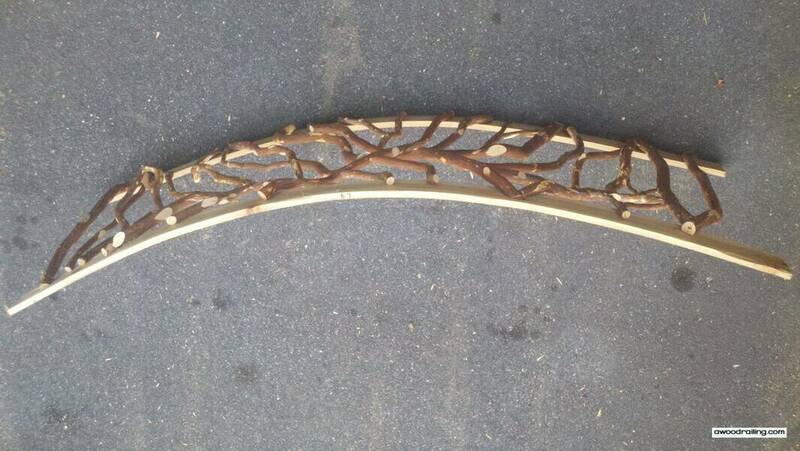 The curved shape itself is unique, but to add the beautiful and creative wood design of Mountain Laurel Handrails takes your design to an entirely new level. These small aspects of interior design are often overlooked in the cookie-cutter approach to home design and home building, but this unique handrail makes a strong and artistic statement. The curved shape can soften up the design of the room and give a feel of more space. The curved balcony handrail, in this case, has opened up space. Even a small feature can add a great amount to the look and feel of the space, as well as giving it a subtle but dramatic update. This great room benefited from curved handrail made with cintricate twig work on the balcony, and the loft becomes a special place to look through the glass doors that open onto the deck and the lake beyond. This curved balcony really created another new way for the owners of this home to enjoy the space, while creating a creative and unique piece for their home. We all work hard here to make sure your home gets the exact pieces it needs, whether those be straight, curved or both. The Wood Railing crew took a ride down to Atlanta recently to install a small project with some curved railings on a balcony. 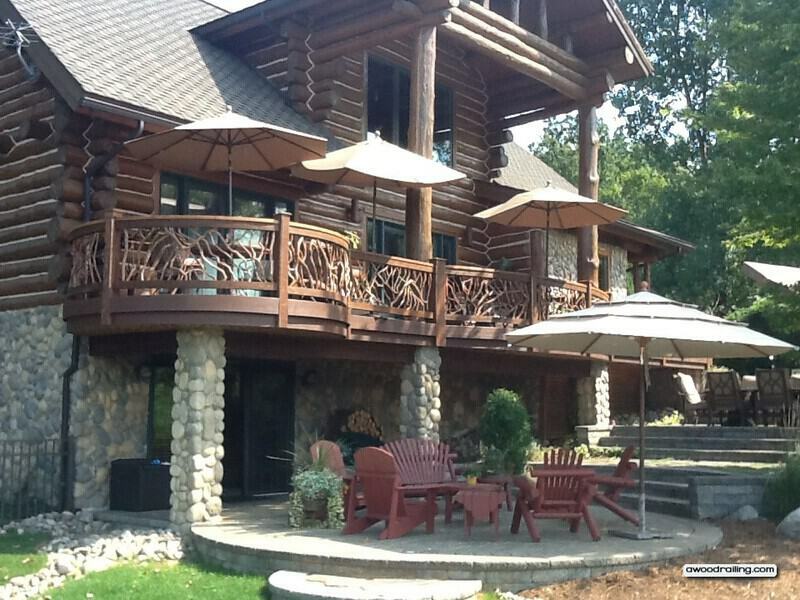 This is a beautifully rebuilt home on the lake with quite a bit of history. The current owner’s father built a house on the property in the 1950s which had been outgrown and was in need of improvement. The contractor building the new home was just beginning his career as a carpenter and helped build the old house. People are oohing and ahhing over your handiwork. Thanks so much for sharing your skills with our family. My family is lucky enough to own this new lakehouse. All of the sub-contractors and craftsmen have incorporated their artistic skills and creativeness into what has turned out to be a most unique dwelling place. We adore our new house. The building process with our fantastic, “attention to every little detail” contractor, Dewane Pugh, has been a delightful experience. These curved railings match the graceful arc of the balcony in this home. 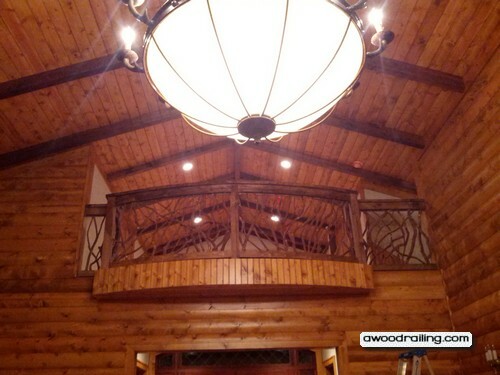 There’s plenty of woodwork with timber rafters and tongue and groove paneling. The home also incorporates wood from the old home, with one room done completely in wormy chestnut paneling from the previous house. There’s also an incredible, real masonry fireplace which are increasingly rare due to the demand for those select few masons with the required education, knowledge and skills. The view from below captures the arc of the balcony nicely. 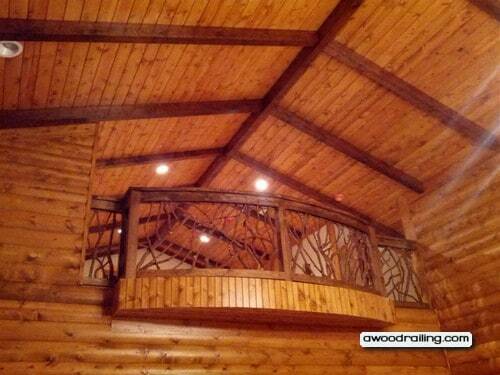 This simple radius helps to break up the straight lines of the timber and paneling, as do the Mountain Laurel Handrails. Additionally, the branches add visual excitement with their organic shapes. 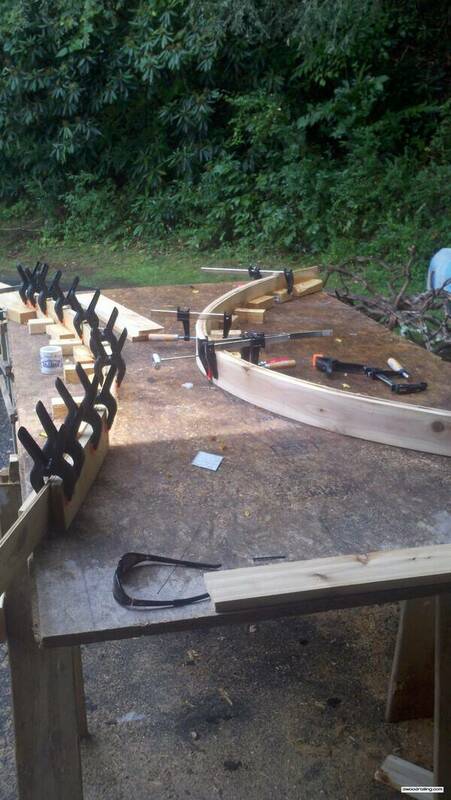 In this section, we will take an in-depth look at the steps in how to make a curved handrail. 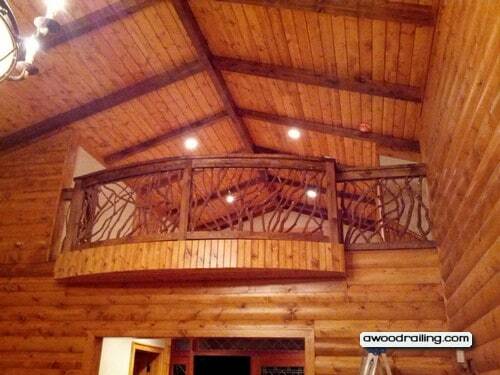 We make curved railing systems that are easy to install. Like any good building project, it starts with a set of plans. 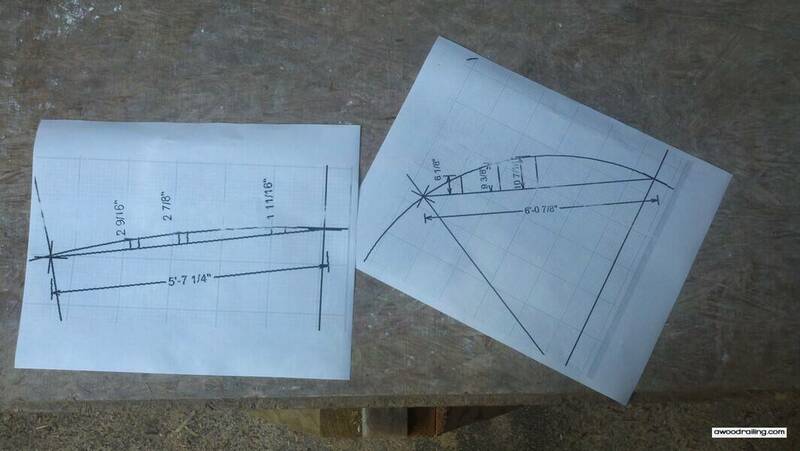 The plans are made in a CAD program and are used for setting up both the bending jig and the building jig. 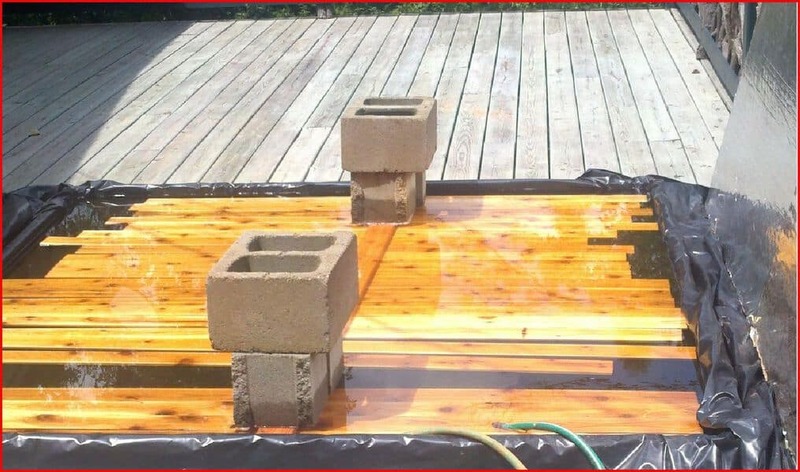 The cedar 1×4 lumber has to soak in a pool for a minimum of 48 full hours, preferably over the weekend. 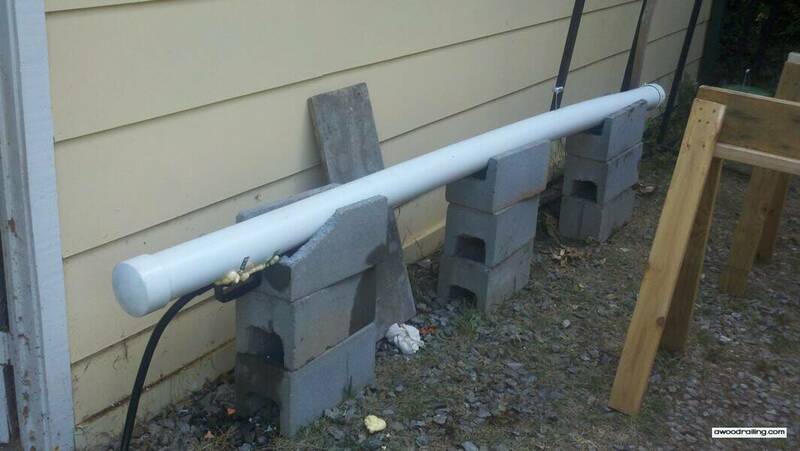 This is a temporary soaking pool made with a 2×4 framework and a piece of black plastic. Heating attempts proved futile. People have asked how to curve wood, and the answer is simple: First, steam the boards and then bend them on a jig. This is how we built a steam chamber to curve wood. A steamer was constructed from a piece of 4″ PVC with a wallpaper steamer attached to a hole cut into the pipe. The hole is sealed with spray foam. For a gentle curve, it takes one tank, and strong curves take two. 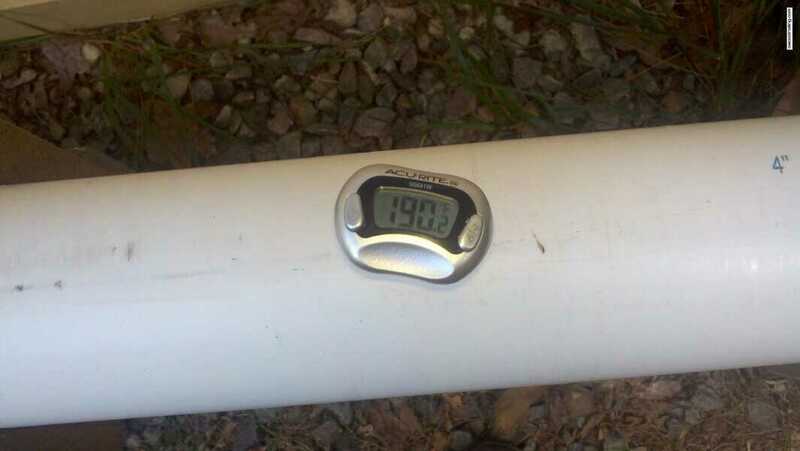 The temperature in the steam chamber. The lumber gets pretty hot also. As the lumber cools, I’ve observed the lumber temperature drop below ambient temperature. I guess this is some kind of runaway reaction as the moisture evaporates into the atmosphere. Scientists, please leave comments explaining this phenomenon. This is the first jig for the bending. It didn’t work. The two jigs are too close together, and the spring clamps are garbage. Only bar clamps work. This is the current system minus the spring clamps. They’re useless. 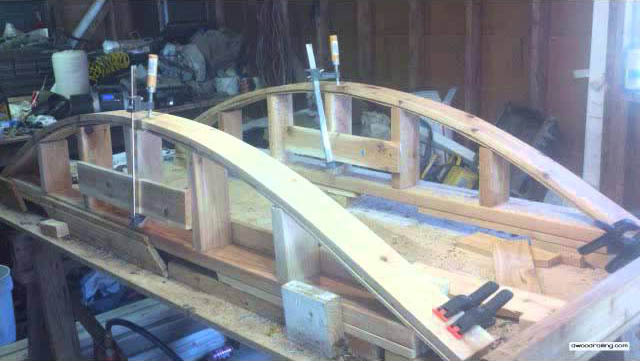 Even for one arc, two jigs are set up for production. 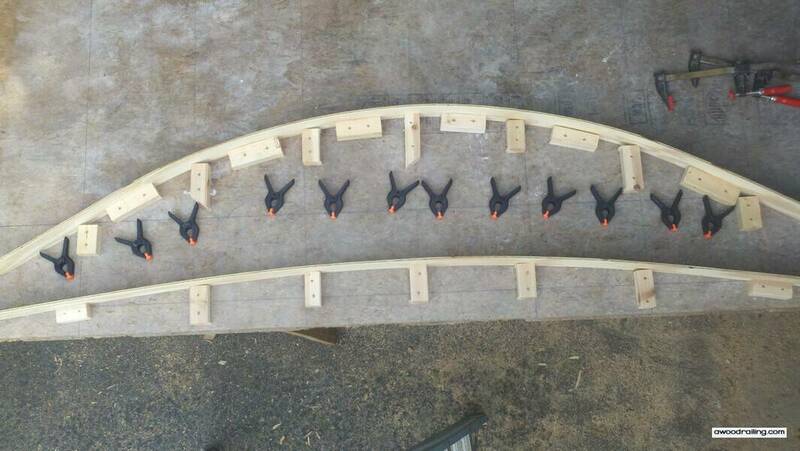 This is a board that has been bent for a curved wood handrail system. This is a board that has been broken. Breaking the boards by bending is not really predictable, not even by the knot locations, although they do break on the knots. We have not yet used any lumber except for the red cedar 1×4 s4s1e pictured here. 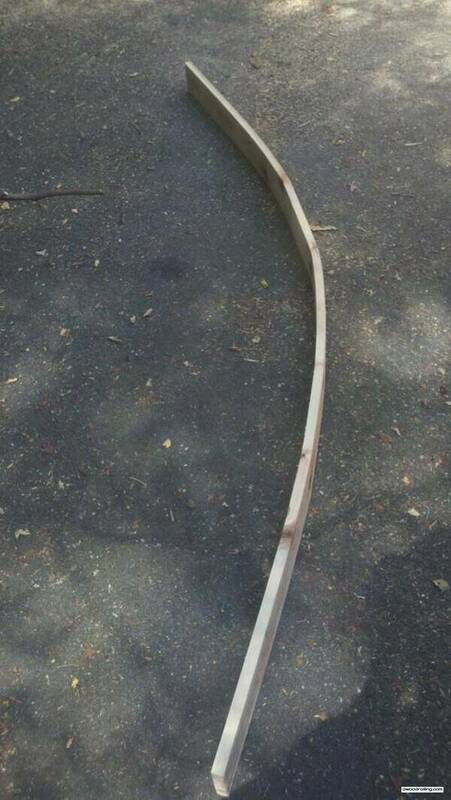 Perhaps clear cedar would bend nicer??? 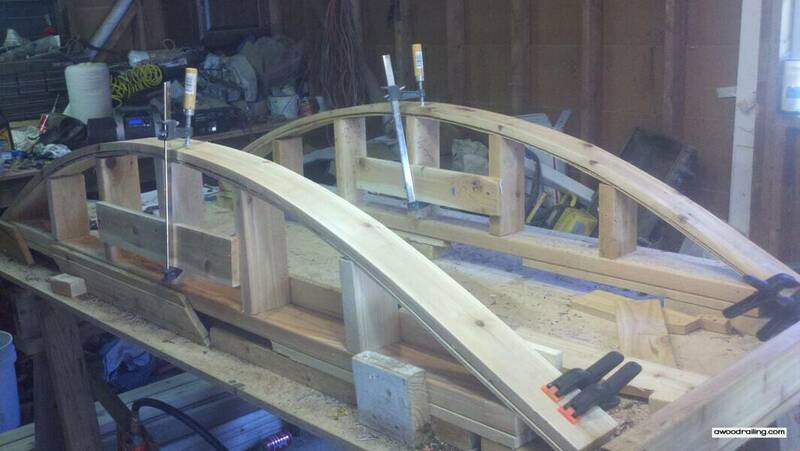 This is the building jig for the curved wood handrail. Lumber sits on the bending jig for 24 hours then goes to storage where it is still under pressure, usually from stacked concrete blocks and pieces of lumber. 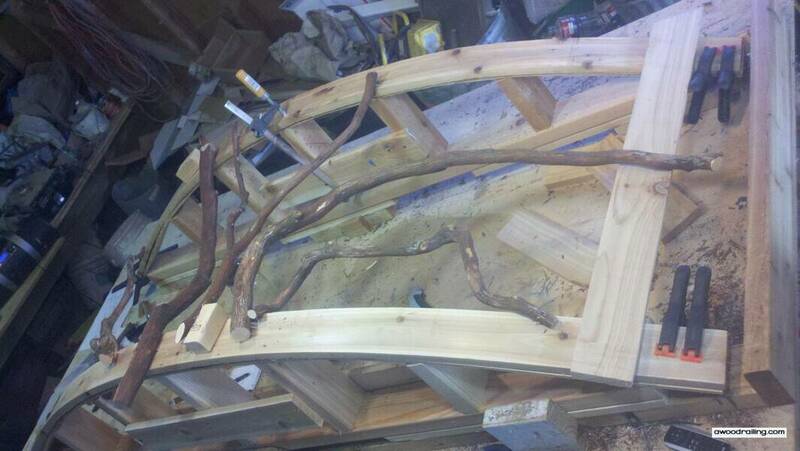 The building jigs go on the table, and the sticks help the railings hold their shape. 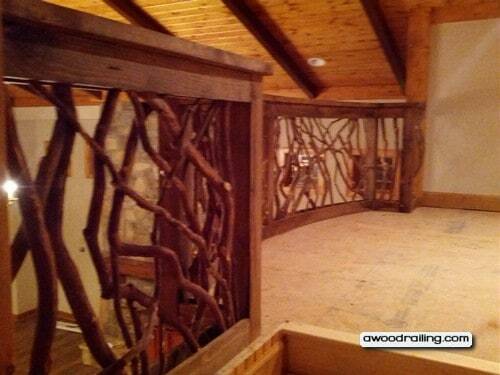 Construction on this section of curved wood railing has begun. From here, it’s just putting on sticks according to the 4″ sphere rule. 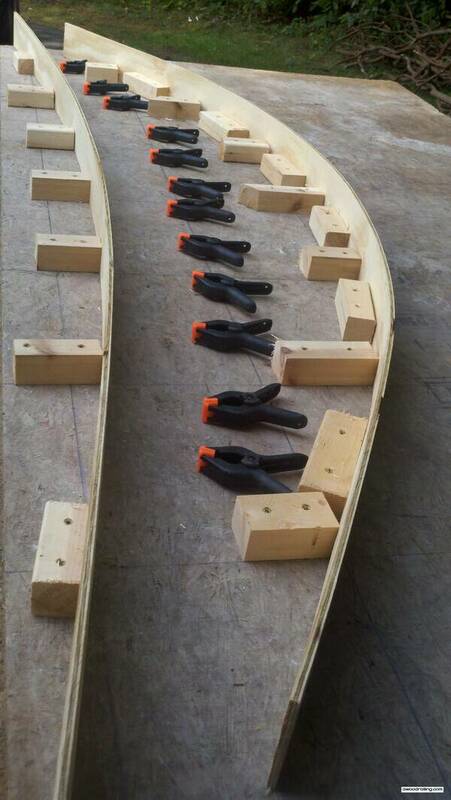 This is an overhead picture of a section for a curved deck railing system that will be shipped directly to the job site. 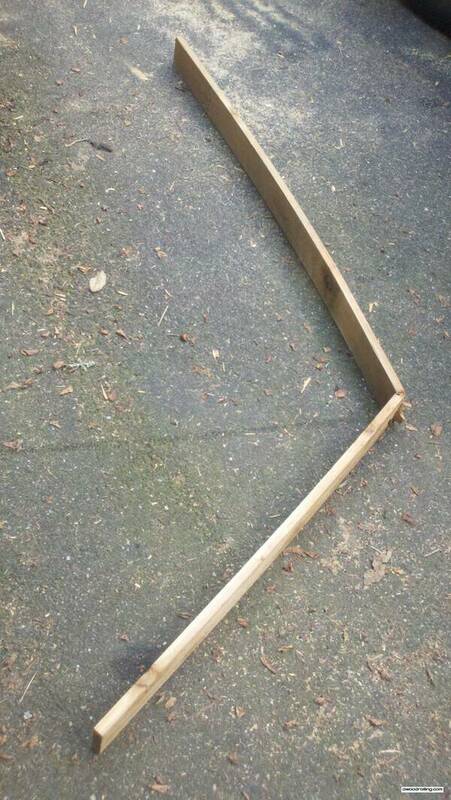 These sections are easy to install by cutting the ends of the lumber to fit the posts. With these instructions, it should be easy to know how to make a curved deck railing. This is a long angle view of a single section of curved deck handrail. Each section is custom built to actual measurements and carefully packaged for shipment. 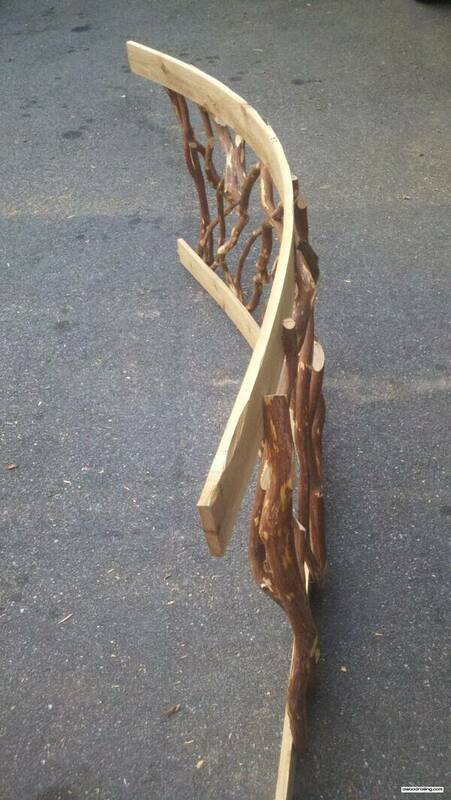 In this picture, curved wood railing sections are collected prior to careful packaging for shipment nationwide. The lumber to complete the outside of the top and bottom of the sections is provided. 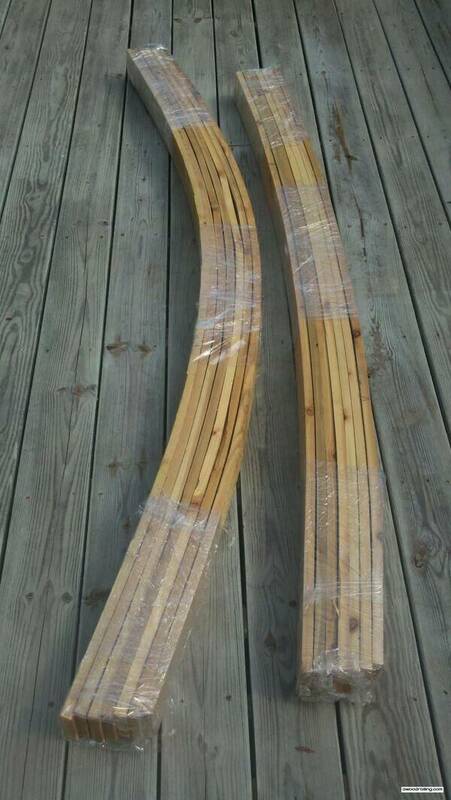 The picture below shows two different arcs that have been bent for a curved deck. The top 2x that caps the railing is not provided and must be installed on site. 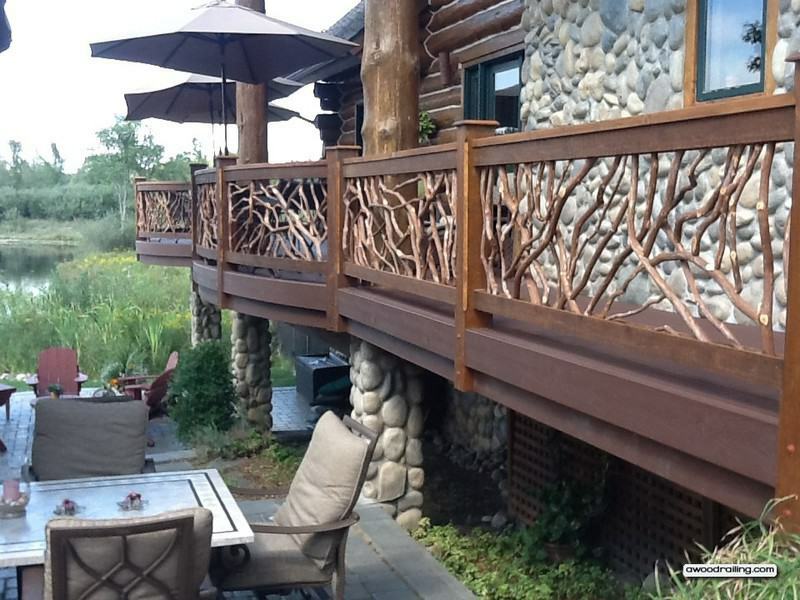 The finished results of installing Mountain Laurel Handrail’s curved railing systems are clear as these pictures speak to their beauty. Contact today to start your project.